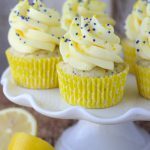 Light and fluffy White Chocolate Mousse frosting on top of zingy lemon cakes. 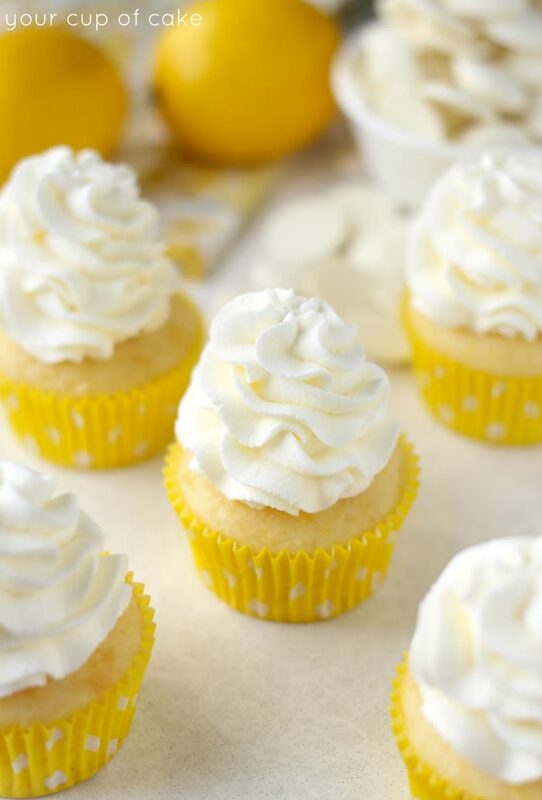 These White Chocolate Lemon Cupcakes are the perfect dessert to start off your spring. 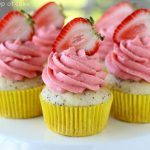 But if you do want a little chocolate in your spring dessert, try the Banana Split Cupcakes that are almost too pretty to eat! This faux mousse is made up of whipping cream and instant pudding mix. 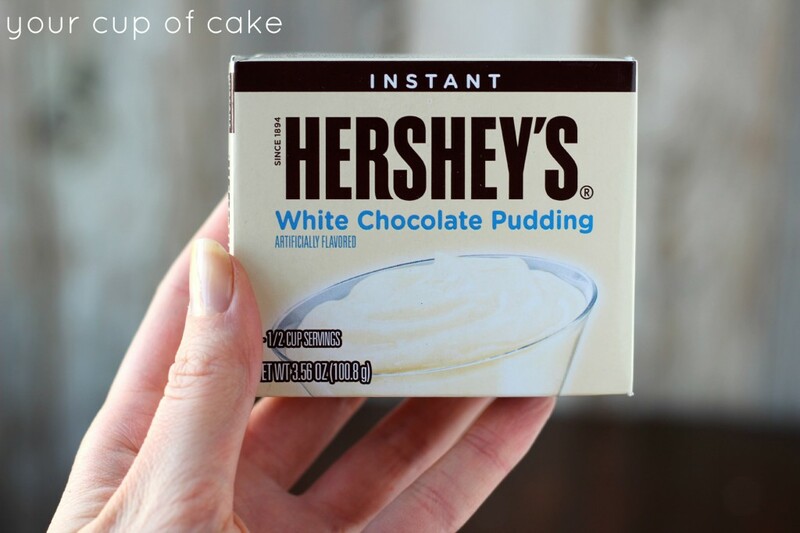 This is my “secret weapon.” I love using this instant pudding mix because this white chocolate flavored mix keeps the whipping cream white. The vanilla flavored pudding mixes will turn it yellow, it will still taste awesome, but it will just be tinted yellow. 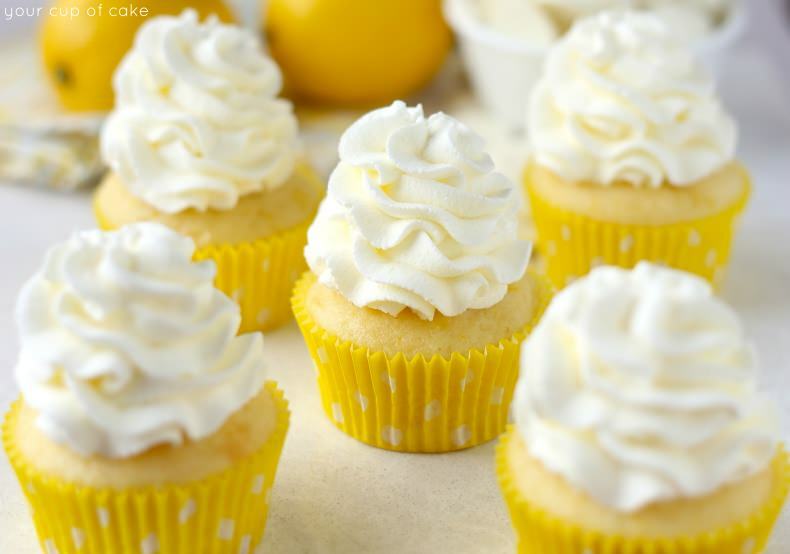 You are going to be obsessed with this frosting. I gave you fair warning 🙂 And yes, you can use it with any flavor pudding mix! And you can even just add 1 or two tablespoons to whipping cream to help stabilize it so it won’t melt in the heat. That’s right. Spring is officially here! 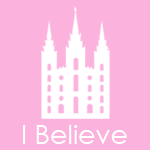 And I’m hoping is won’t snow again here in Utah, I’m ready for warm nights and smelling like campfire. Plus, my car is so dirty from all the gross snow but I refuse to wash it until I see only sunshine in the 7-day forecast. 2. 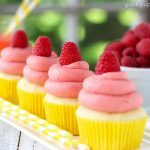 Sift cake mix into a large bowl to remove any lumps. 3. Add remaining cake ingredients and stir until smooth. 4. 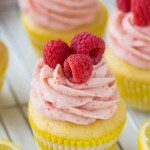 Fill cupcake liners 3/4 full and bake for 15-20 minutes or until an inserted knife comes out clean. 7. Pipe onto cooled cupcakes. 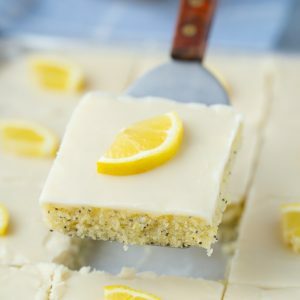 NOTE: You can use a lemon cake mix and omit lemon zest and lemon juice, replace juice with extra milk. Can you tell me about how long the White Chocolate Mousse will keep and can it be kept out on counter. 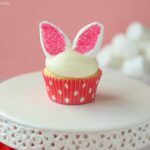 Thinking about making these for my Granddaughter for Easter. Cindy, I work in an office setting & have used this frosting several times. I frost the night before (keep chilled until next morning). I goto work at 7:30 where they will sit on a desk until lunch-time potlucks. They are eaten by 12:30-1. I’ve never had a problem keeping the frosting stable. Treat it like you would whipped cream… it won’t melt but it could turn. Though I will be honest, I’ve kept it out from morning util night and it tastes totally fine! These are so pretty! What tip did you use to pipe these? You’re so right!!! 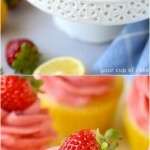 You can click on the youtube icon at the top right of my blog here and watch one of my 2 cupcake piping tutorials! Lizzy! This is perfect for spring. I have a ton of yellow grapefruit. You think it will work the same? 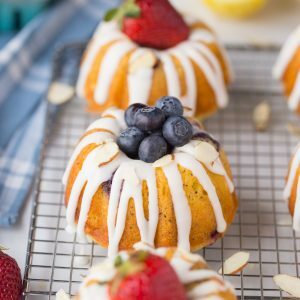 In the cake recipe? Oh yes! I LOVE grapefruit! 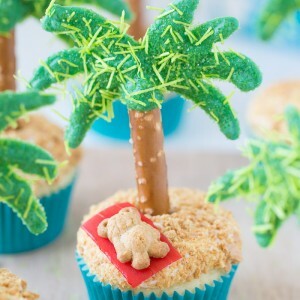 Hi Lizzy, i love your books, and i have baked many of your recipes. 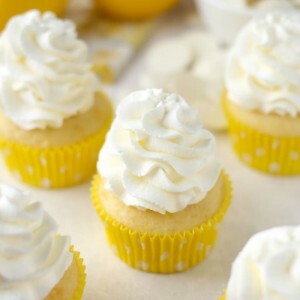 I live in Australia and would love to make the lemon white chocolate cupcake, but we don’t have white chocolate pudding, only vanilla or chocolate pudding. Do you have a recipe for white chocolate pudding or another substitute i could use. It’s the same with me in Germany. But I know that pudding is easy to mix at home (i. e. just corn starch with vanilla extract). Can I use the corn starch with melted white chocolate as well? Any experiences? I honestly have no idea how to make it, you may want to google that one. But go ahead and make the chocolate or the vanilla. 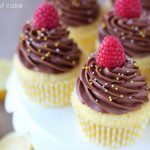 I use the chocolate version ALL the time on vanilla or yellow or chocolate cupcakes and it’s so fun! 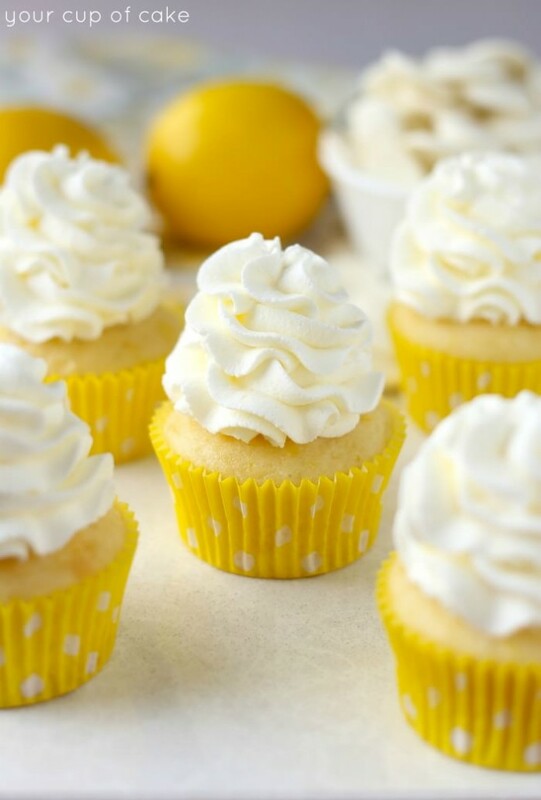 Lemon Cupcakes are my absolute favorite. And perfect for Spring! I’m so over cold and snow, too. Bring on the spring flavors! 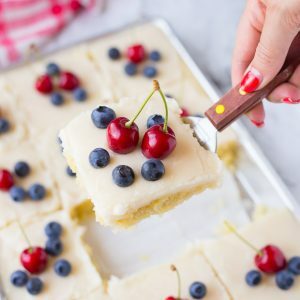 can I make a cake with this recipe instead? and how long on the oven? 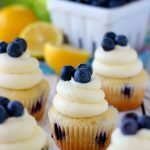 thanks in advance…LOVE YOUR RECIPES!! It depends on what size pan you are using!